Plaza de République, Paris, on Nov. 30. Editor's Note: The following is an opinion piece by Petrolia playwright David Simpson, who co-founded the Mattole Salmon Group and currently sits on its board of directors. A climate change activist, Simpson is attending the 21st United Nations Conference of the Parties in Paris and will be sharing his thoughts with the Journal periodically. In the years since, one opportunity after another has slipped by as delegates to the succession of COP’s kicked the ball of serious reduction down the field, claimed success and then escaped homeward. They did this despite the ever-louder drumbeat of scientific research telling us that our burning of fossil fuels was the problem, and that it was in essence suicidal for our species. Then, murderous acts of terrorism struck the city a mere two weeks before this climate conference was set to begin and threatened to derail the process. In the aftermath of the attack, French President Francois Hollande outlawed all political gatherings of more than two people in the streets of Paris, a rather draconian and unenforceable mandate under any circumstances. 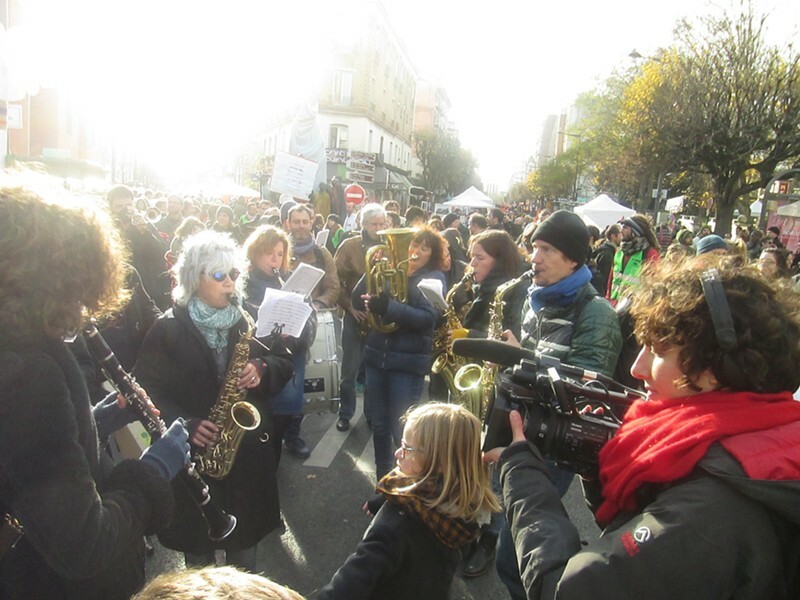 The decree shut down what was expected to have been a great, celebratory demonstration on Nov. 29, the day before COP 21 was to begin. Hundreds of thousand of people had been expected to take to the streets in a march organized to ratchet up pressure on negotiators to produce an aggressive treaty. Hollande’s claim that he was instituting this ban to protect crowds of people that might draw terrorist acts did not extend to the huge crowd that was allowed to attend the weekend’s soccer game. Worldwide, environmental demonstrations, some of them numbering in the tens of thousands, did materialize. 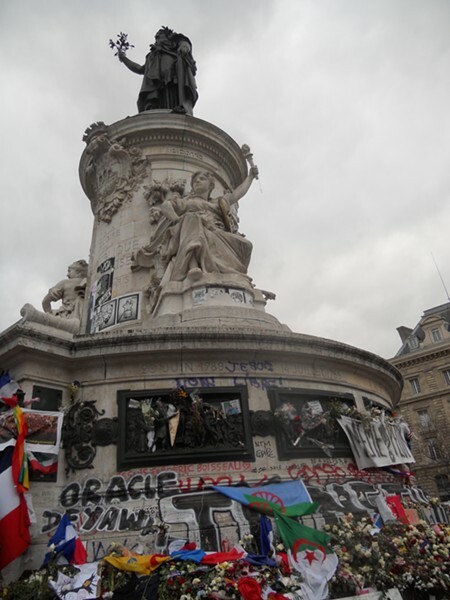 In Paris, though, a quiet holding of hands at the Place de Republique near the city’s center was very touching but involved only a few thousand people brave enough to ignore the ban. A more aggressive demonstration did follow, but the issue by then had become freedom of expression rather than addressing climate change, a shift of emphasis that bode ill for development of a strong position by governments to face climate change head on. It did, however, manage to provoke a small army of police employing percussion grenades and tear gas to sweep the plaza numerous times before the demonstrators fully dispersed. The smell of tear gas and the specter of legions of police in riot gear provided, in themselves, reason for conference participants to keep a grip on their expectations for COP 21. 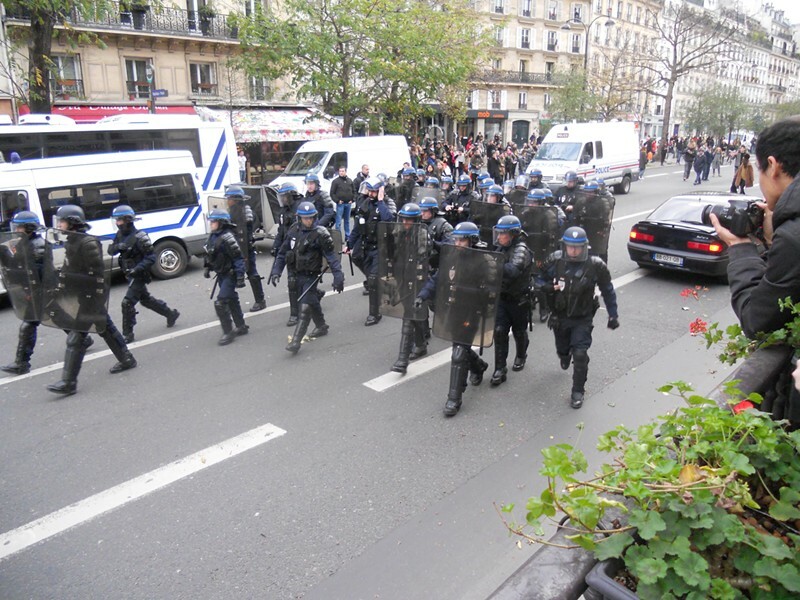 Police move to rein in a climate protest on the Plaza de Republique in Paris on Nov. 30. Then on the conference’s very first day, while hundreds of workers were still urgently hustling to complete the skin around the skeletal framework of the convention center in Le Bourget, a northern suburb of Paris, a torrent of upbeat dignitaries — heads of state — descended on the COP grounds like a covey of cheery debutantes ready to be courted. There were more than 150 of them. (The UNFCCC has 196 member countries.) UN Director General Ban ki Moon later said that, in all his years of diplomacy, he had never seen so many heads of state gathered in one place. These happy grandees were led by Hollande, UN Climate Secretariat head Christiana Figures, COP President Laurent Fabius and France’s Minister of Ecology Segolene Royal. Among the other heads of state, China’s Xi Jinping and India’s Narendra Modi had critical roles to play during their brief stays in Le Bourget. Vladimir Putin was present, though it was difficult to sense whether he was being cheerful. It was a more or less first outing on the world stage for Canada’s legacy Prime Minister Justin Trudeau, who had to compete for the title of best-looking head of state with Mexico’s Pena Nieto, Mark Rutte of the Netherlands and Michelle Bachelet of Chile. Obama, of course, was happily in attendance; climate change is an issue close to his heart. His attention, though, as well as that of several others, was painfully divided between climate talks and those more private ones concerning the acts of terrorism that preceded the COP. The distraction spelled out yet again how much this act had distracted the world from giving its full attention to the looming ecological disaster. Each of these gleaming leaders including, interestingly enough, Prince Charles and (Prince?) Al Gore made what would, in Cuba, pass for a brief speech. Cumulatively, they were mind-numbing, but all of them reflected upon the ever more dangerous impasse the species has worked itself into. No denial was voiced by the speakers, no efforts to slip out from under a share of the responsibility and point fingers. Long-standing demands by climate activists for more ambition by negotiators seem to have found fertile ground at last. “Ambition,” in fact, was on the tongue of almost every speaker as if they had invented the concept themselves rather than had civil society foist it upon them. Overall, there was a new sense of urgency, a new recognition that the world that our children and grandchildren are going to inherit might not be livable. Almost every speech mentioned the need for a price on carbon, an acceptance that seemed to carry even into the corporate ranks. Also interesting, a call from 106 vulnerable, lesser developed countries, urged reconsideration of the “target” for greenhouse gas reductions. In 2010 in Durban, the UNFCCC more or less officially accepted 2 degrees centigrade as the highest we could allow world temperature to rise over pre-industrial levels. Even then, though, there was a strong opinion that 2 degrees was too much and that a 1.5 rise was a more likely target to keep environmental-social disasters to a survivable level. The cumulative sense that emerged from the many speeches was of honest recognition of the real seriousness of the problem, an acceptance that we are all in it together and a determination to take whatever measures necessary to allow our civilizations to survive and ultimately thrive along sustainable lines. A Parade, part of the “alternative” conference in Montreiul, a suburb of Paris on Dec. 5. That this same content and language was mirrored in almost every presentation or text coming out of the corporate sector from its several warrens scattered about the COP campus was worrisome, given long experience with co-options and green washing by large commercial interests. The UN Climate Secretariat, the UNFCCC, admitted openly that 20 percent of the $170 million dollars this two-week event cost was coming from corporate sponsors, whose emblems and events are scattered throughout the halls at Le Bourget and who themselves are major polluters. Themes that have played out over pretty nearly the whole history of the COP hover eagerly in the wings once more, threatening to recapture center stage at first opportunity. Finance is still the irritating Dark Star of the event. It has of course, to do with the fact that, from the start of the UNFCCC process, there was a formal recognition of “differentiation” of wealth between countries and of coinciding different levels of responsibility. The basic obligation is still there, though in the current deal it is less enforceable than ever. There are no mandatory requirements or calls for any clear monitoring and review. The obligation is truly bottoms up — what each nation wants to do and give, not based on any calculations or data that science could provide as guidelines. But the obligation must be understood as both moral and practical. It is moral because it is basically unfair for one country or region of the world to have easy access to fuels for development and maintenance of a comfortable life style while another can barely guarantee a means of survival for its citizens. This is especially true when the well-off country has already polluted more than its fair share of atmospheric space in its push to develop. The practicality comes into play with the recognition that the poorer people in the world and their governments are going to naturally seek higher levels of development. Unless new, carbon-free technologies are made available to them affordably, poorer countries — mostly in what is known as the Global South and especially in Africa — are going to turn to coal or other fossil fuels. The impacts of the additional CO2 released into the atmosphere will likely put the situation we all share beyond recovery. For the well-off, the situation requires that they help the poor pull back from the brink, or that they ultimately go down with them. It really isn’t a choice. The issues, though, did not simply disappear into a choiceless awareness. After the great rush of political celebrities over the first day and into the second, the moving parts of the event — discussions of details of whatever draft of the hoped-for agreement were currently at play — carried on. optimism of opening day is waning in face of what seems to be the same old arrogant behavior on the part of the powerful. The great game is on. The second half of the first week was somewhat quieter, as if in anticipation of the final delegation-level draft of the text. It was prepared, in principle,Friday and then delivered during the weekend from the delegations into the hands of Fabius, the COP president . He and his team, in turn, will dust and polish it up a little to make it presentable for the ministers whose deliberations began yesterday. It will carry forward until a final agreement is reached ideally by Friday, or, God forbid, not reached at all. There are climate activists who think that no agreement is better than a bad one. There will have to be cooperation between elements in the process who often dwell in fairly profound disagreement. Neither side seems able to muster a positive thought about the fossil fuel corporations or paint the canvass of their long-term future with a rosy glow. So this enormous process, this ship whose cargo represents a fair cut of the humanity in whose interests it sails, turns into a new wind.